in millions of companies worldwide. Use our Chrome Extension to find and prospects emails from social networks like Linkedin, Facebook, Twitter. Find various email addresses from a list of names and companies or domains. Clean any sized list to eliminate hard bounces and improve your email marketing campaigns performance. Use Zapier to connect Findthat with more than 500+ integrations available. How companies are using Findthat? The foundation of a successful sales team is it pipeline. Use our Email Finder to find the email addresses of professionals and later send them to your favorite sales solution. Boost your email campaigns performance by eliminating hard-bounces. Our email checker requires a cross-check before calling an email valid. 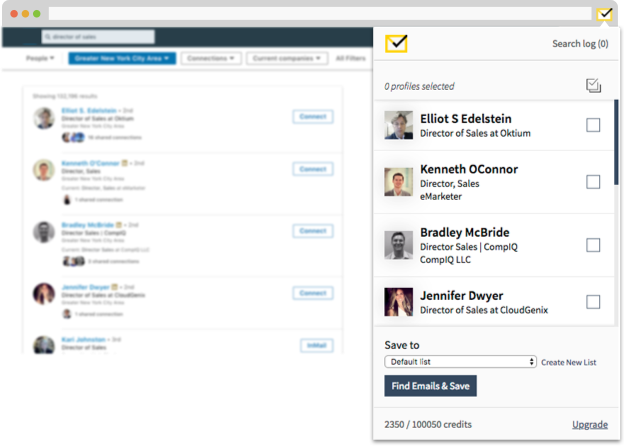 Finding the right candidate profile isn't the hard part but getting in touch is, use our Chrome extension to find email addresses and save them to organized lists. Email is the best channel to build long-lasting relationships. Build lists of potential partners or simply find them on social media to reveal their email address. Spread your content like fire, build links and trust by reaching out to blogs and related sites by finding article authors email addresses. Create a strong buzz on your next product/feature launch by finding the email address of related reporters and reaching out to them. Find one or multiple social profiles emails addressed with a single click. Build prospect list export or send them to other solutions using Zapier. Save time, search in background and browse results on our search log. "It's best, providing 90% accurate email, that are very helpful to us. Thanks to #findthatemail team"
"As you can see, Find That Email showed the best results in my test, It found 23 of 25 email addressed - a 92% success rate. Email Hunter, Voila Norber, no offence...that's still a pretty big win!" We are big on data accuracy, we never use scraped public data, guess emails or rely just on patterns. Our engines are constantly fed new data sources and automatically remove false records. Supercharge your app with our REST API, search or verify emails with a single HTTP request, read instructions. A confidence score is sent for every email address result to assure smooth deliverability. No start up costs. No long-term contracts. Cancel or export your data at any given time.